Some of my best food comes like a revelation to me. I just try it and see how it turns out. This was a fantastic idea and worked out perfect. 1. Marinate thawed and pounded chicken breast in Italian dressing. I make my own with the Good Seasonings packets. It’s just the seasonings in water, oil, and vinegar. Marinate for as little as 5 minutes and as long as all day. 2. Grill chicken on low on outdoor BBQ. 3. Cut ripe avocado, lettuce, onion and tomato if you’d like. 4. 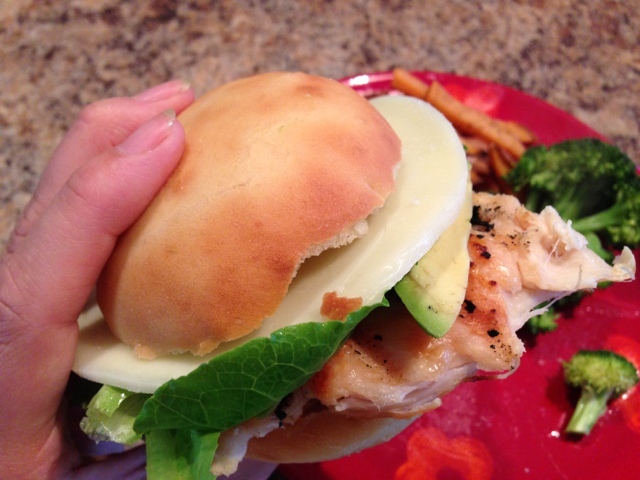 When chicken is done cut to size to fit bun. I only used half of the breast. Use provolone cheese on top. Load with the avocado and other goodies. 5. Top with bun. I used a homemade bun that I had in the freezer. Simple to just thaw it. 6. Serve with sweet potato fries (cut, toss in olive oil, salt, pepper, and bake in the oven at 400 degrees until done) and steamed broccoli!